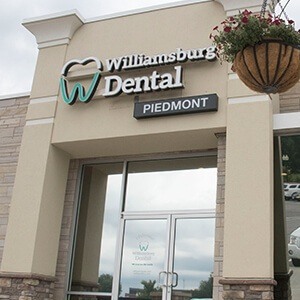 When you visit Williamsburg Dental Piedmont, our goal is to give you absolutely everything you need under one roof. Sound like a challenge? We’re ready for it! With us, you’ll get the same friendly, one-on-one service you’d expect from a small private practice as well as the comprehensive treatment options and state-of-the-art technology like a large corporate one. We’re able to provide everything from basic preventive care to renewing restoration solutions to transformative cosmetic treatments and more. We’re also happy to serve the entire family, so whether you’re looking for a dentist for yourself, your child, or both, we’re ready and able to see you! Our practice is staffed by a team of highly-trained dental professionals completely dedicated to serving your smile. When you come to see us, you can trust that you’ll be treated by a doctor who will make you their number one priority and is able to completely personalize your care to meet your individual dental needs. All in all, we’ll do everything we can to make sure you achieve (and keep) a healthy, beautiful smile for decades to come.